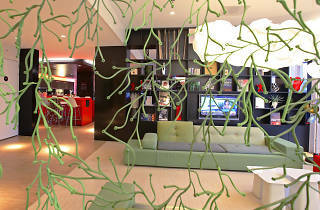 Welcome to the future of hotels: the shipping container at CitizenM. Due to the housing shortage in Amsterdam, local students have long been living in these humble units, but it's safe to say that CitizenM was the first initiative to utilise them as the basis for a 'budget luxury' designer hotel. CitizenM's initiator is Rattan Chadha, who left his role as founder and CEO of Amsterdam-based clothing chain Mexx to cover the globe with shipping container hotels. The first opened at Schiphol Airport in 2008 and was the result of a partnership with advertisers KesselsKramer, who commissioned local design gurus Concrete to style it, and Philips to do the technology. This newer branch, near the Zuidas business district, is on the outskirts of the city centre but is well served by public transport, meaning you can be in postcard territory within minutes. The idea was to strip things down to the bare essentials: 14 square-metre (150-square-foot) rooms are created and assembled off-site, and have wall-to-wall windows, a shower pod, a toilet pod, a king-size bed with luxury linens, flatscreen TV, and a 'mood pad', which controls all of the above plus the lights and temperature. The resulting accommodation is surprisingly comfortable. 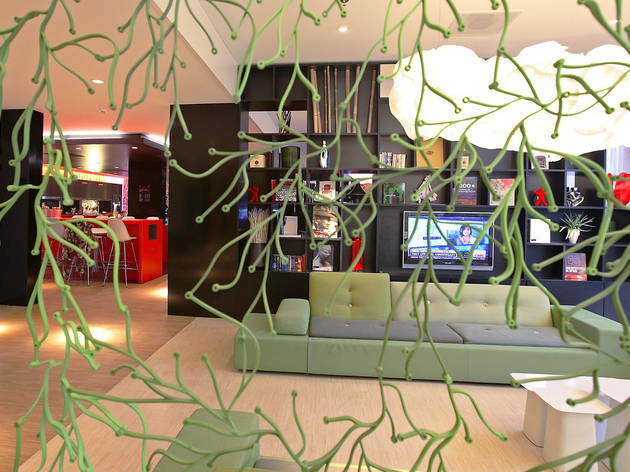 While the branding is aimed at the new young, global jet-set class, so far it seems that traditional business travellers are keen to make use of CitizenM in the name of taking advantage of a (relative) bargain. Meanwhile, if the lobby feels like a Vitra furniture showroom (albeit one with self-service check-in), that's because it is. And for those arriving late or making an early start, there are refreshments available 24/7 from the 'canteen'.